Wilkes University teacher and sailor Dave Poyer’s newest book, THE WHITENESS OF THE WHALE, is hot off the press! After a tragic accident maims her laboratory assistant, Dr. Sara Pollard’s career as a primate behaviorist lies in ruins. With nothing left to lose, Pollard – descendant of a Nantucket captain whose ship was sunk by a rogue whale – accepts an offer to join anti-whaling activists on a round-the-world racing yacht as the resident scientist. The plan is to sail from Argentina to the stormy Antarctic Sea. There they’ll shadow, harass, and expose the Japanese fleet, which continues to kill and process endangered whales in internationally-declared sanctuaries. But everyone aboard Black Anemone has a secret, or something to live down. Her crew—including a beautiful but narcissistic film celebrity, an Afghan War veteran in search of the buzz of combat, and an enigmatic, obsessive captain—will confront hostile whalers, brutal weather, dangerous ice, near-mutiny, and romantic conflict. Yet no one aboard is prepared for what Nature herself has in store . . . when they’re targeted by a massive creature with a murderous agenda of its own. Filled with violence, beauty, and magical evocations of life in the most remote waters on Earth, The Whiteness of the Whale is a powerful adventure by a master novelist. Kirkus Reviews also had great stuff to say about The Whiteness of the Whale: “Poyer’s thriller takes fans on a frightening ride that will have them reaching for their Dramamine…. Poyer spent a great deal of his life on the ocean, and it shows. This is a fine thriller.” Read the full review here. And, the Feb 15 issue of Booklist has this to say: “It’s the crew members who propel the story, the author exploring their hidden pasts, their personal agendas, and the relationships that spring up among them. Some readers might feel Poyer goes a bit far—the book takes a very dark turn about two-thirds of the way through that might stretch credibility a little—but the story is undeniably powerful.” Find more here. St. Martin’s Press, $26.99 (336p). April 2013. Media & Review Copies: Contact Joseph Rinaldi from the St. Martin’s publicity department. David Poyer is at it again with a new book sure to thrill and entertain. The Whiteness of the Whale is available for pre-order now and has received some wonderful advance praise that should motivate readers to get in line for a hot-off-the-press copy. 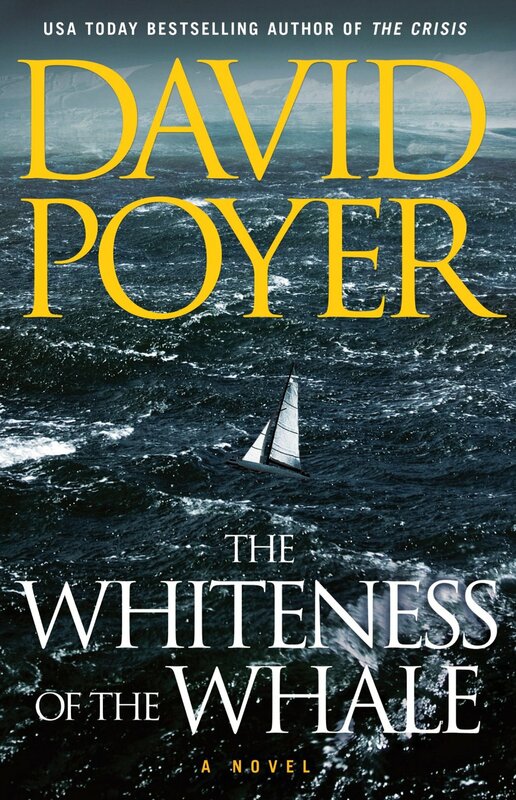 An antiwhaling expedition to the freezing Antarctic takes a violent turn in this powerful novel from bestselling author and sailor David Poyer. After a tragic accident maims her laboratory assistant, Dr. Sara Pollard’s career as a primate behaviorist lies in ruins. With nothing left to lose, Pollard – descendant of a Nantucket captain whose ship was sunk by a rogue whale – accepts an offer to join anti-whaling activists on a round-the-world racing yacht as the resident scientist. The plan is to sail from Argentina to the stormy Antarctic Sea. There they’ll shadow, harass, and expose the Japanese fleet, which continues to kill and process endangered whales in internationally-declared sanctuaries. But everyone aboard Black Anemone has a secret, or something to live down. Her crew—including a beautiful but narcissistic film celebrity, an Afghan War veteran in search of the buzz of combat, and an enigmatic, obsessive captain—will confront hostile whalers, brutal weather, dangerous ice, near-mutiny, and romantic conflict. But no one aboard is prepared for what Nature herself has in store . . . when they’re targeted by a massive creature with a murderous agenda of its own. How much would you give to talk quietly for just one hour with your great-grandmother? Most likely, almost anything. But probably you can’t buy it at any price. Time’s torrent rushes by, isolating us like a hurricane-driven tide, the rising sea cutting us off from those who went before. It bears away the old voices and the old ways. Bears away too much of what we loved, and what we realize, too late, we still desperately need. This book’s a bridge to that past. In a series of interviews conducted in the late 1970’s and early 1980’s, nine old people recounted their lives on a string of isolated islands of the North Carolina coast. The Outer Banks are a hundred-mile arch of barrier islands, from a few thousand feet to three miles across, punctuated by narrow inlets to the Atlantic. Low, backed by wide brackish sounds, they’re lands of the margin; half-land, half-sea; shaped by the eternal struggle of sea-currents, vulnerable to hurricane and war. These nine survivors tell of childhood, courting, marriage, and children; of hurricanes, depressions, wars, and death; of faith, doubt, love, and fear. They watched the Wright brothers fly; saw U-boats torpedo ships close offshore; dealt with blindness and heartbreak and shipwreck. Then, near the end of their voyages, they lingered for a little while to tell us of The Way Things Were. And they’ll tell us more — if we’ll listen. With a little urging, they’ll share their thoughts on the ultimate questions; good and evil, youth and age, triumph and suffering. From their first word, they cast a spell. 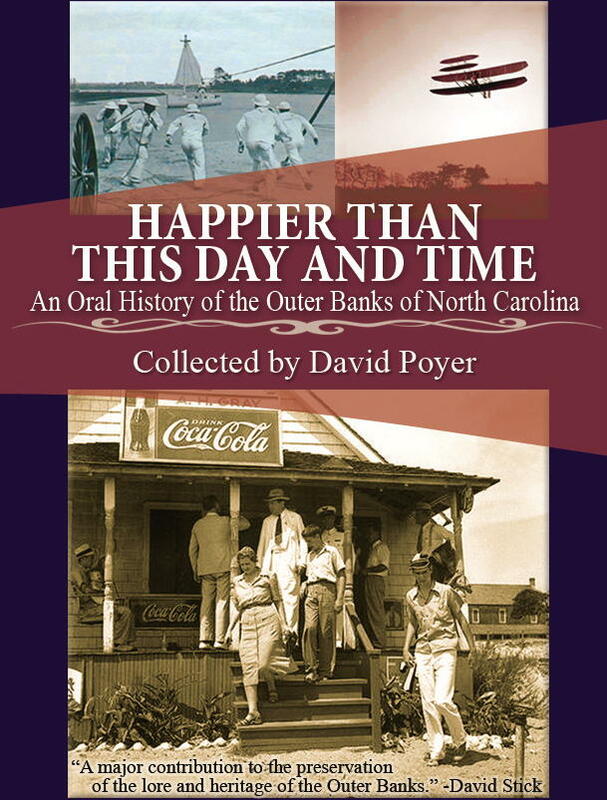 Happier than This Day and Time: An Oral History of the Outer Banks of North Carolina is available on Kindle at Amazon or on Nook at B&N for a mere $3.99.